Kander & Ebb's 1984 musical The Rink made it's not very successful West End debut in 1988 (at the Cambridge Theatre), but then again the musical's original Broadway run in 1984 had not been much of a success either, despite the presence of Chita Rivera and Liza Minelli in the cast. The strange thing is that the piece seems to have created more of an effect when playing in smaller theatres. 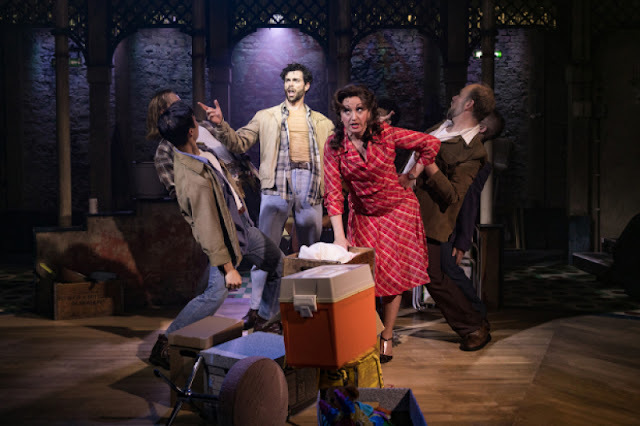 The new production of The Rink at the Southwark Playhouse (the musical's first London appearance since 1988), directed by Adam Lenson with musical director Joe Bunker, completely re-focussed the show. Lenson and his designers Bec Chippendale and Libby Todd concentrated on the relationship between the two women, mother Anna (Caroline O'Connor) and daughter Angel (Gemma Sutton), creating effectively a strong two-hander. 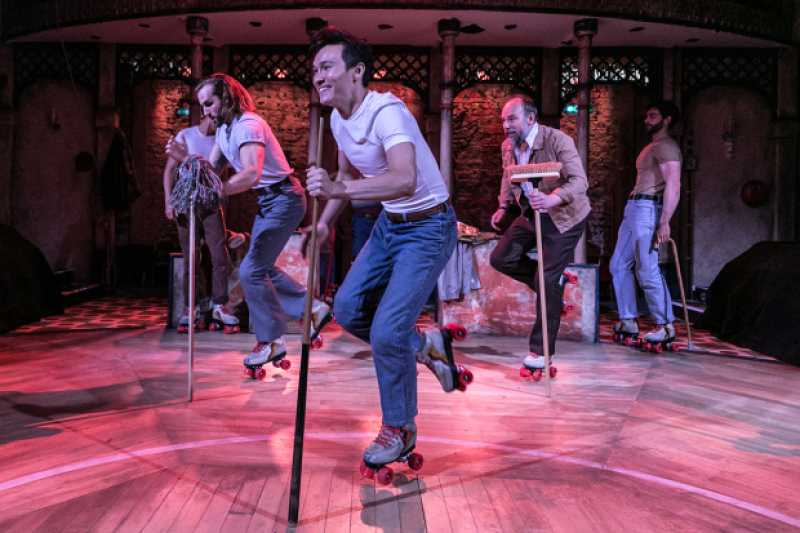 Not that the large-scale numbers were neglected, we did have dance (and roller-skate) numbers from the ensemble of six, Stewart Clarke, Ross Dawes, Michael Lin, Elander Moore, Ben Redfern and Jason Winter. I did see the original 1988 production and my main memory of it is the way the piece got rather lost in the huge set of the dilapidated roller-skating rink. At Southwark there was no such problem, the audience sat on three sides of what was effectively the rink, with the back-drop formed of the balcony at one end (with the band on the balcony). 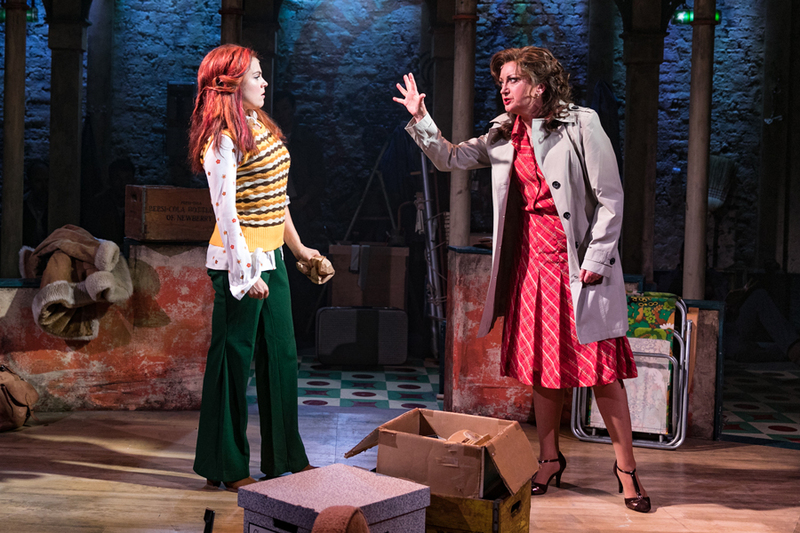 It was very effective and gave just enough space for the ensemble numbers, whilst ensuring that Caroline O'Connor and Gemma Sutton could fill the space with their powerful and tense relationship. The show is relatively unusual in that it has two belt roles, the role of Angel was created for Liza Minelli who was hardly an ingenue. The plot is relatively minimal, what happens is less important than the way the two interact and fight. An important part of this process is the realisation that they are remarkably alike 'The Apple doesn't fall far from the tree'. The piece proceeds via a series of flashbacks as each woman narrates events from the past so that the evening becomes a seamless exploration of the layers of their relationship. The six men in the ensemble moved easily between the role of workers come to demolish the rink and people from the women's past notably Anna husband Dino (Stewart Clarke), her father-in-law Lino (Ross Dawes) and childhood sweetheart (Ben Redfern) and many others. Despite Gemma Sutton having to play Angel's five-year-old self, we always knew when were were, as time flowed easily between past and present. Terence McNally's book is funny, with lots of one-line wise-cracks. Again, having a smaller house meant that both Caroline O'Connor and Gemma Sutton were able to bring these off, and make the piece funny, ironic and tragic. The life depicted is rather ordinary and sad, with the rink standing in for all the ideas that we cling onto from the past. But there was another layer too, a sadness for a lost way of life, the disappearance of the old seaside boardwalks and their entertainments, including a lovely song 'What happened to the old days? ', a trio for Anna (Caroline O'Connor) and two of her female neighbours (played by Ross Dawes and Ben Redfern). Caroline O'Connor gave a corruscating performance as Anna. O'Connor has history with the show, she understudied Angel in the original 1988 production. 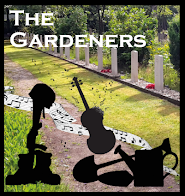 Here she brought a superbly expressive belt voice and razor wit to a gift of a part, as Anna's wisecracking carapace is gradually cracked to reveal the tragedies in her life she is trying to hide. The show was miked (sound designer Mike Thacker for Orbital Sound) but it was beautifully judged and O'Connor's voice was never over-done and you really felt she could have filled the space without any help. This role is on a par with Mamma Rose in Gypsy, another highly damaged woman, and O'Connor fully realised the whole of it, giving a mega-watt performance which was full of subtlety too. O'Connor was finely matched by Gemma Sutton's Angel, another damaged soul who matches her mother wise-crack for wise-crack and gives very little away until the closing pages when all the revelations are done. Sutton brilliantly caught Angel's prickly nature, but also the sadness and wistfulness for the security of the old day, particularly in 'Coloured Lights' which closed Act One. Whilst O'Connor did full justice to the belt moments in the part and brought in quietly subtle singing too, I did not feel that the various parts of her voice always quite joined up. But overall, this was a powerful and touching account of a difficult part, a heroine who does not always want to be loved. The ensemble was a towering support, very much all singing, all dancing, all acting. And it was notable that not all the six men were classic young dancers, yet all were brilliant in the ensemble dance numbers. 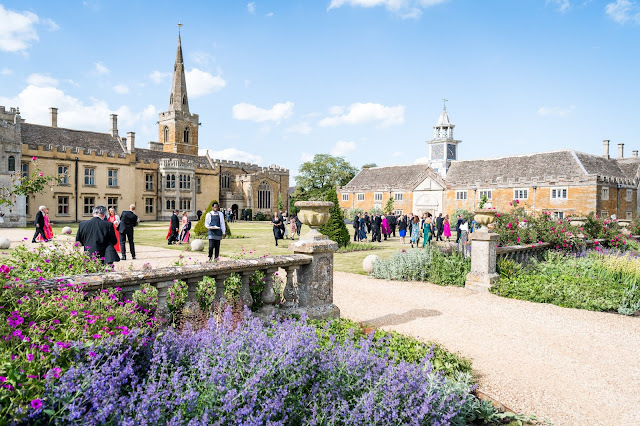 The two strong lead roles need a powerful back-drop and this was provided by the ensemble, creating real support and a strongly characterised background. Singing in such a small space, with the audience so close, is hardly an easy task yet all eight seemed able to do so without compromising that fourth wall. Having the audience on three sides though did mean that occasionally words were lost with cast members facing the 'wrong' way, and I was aware that a couple of details of the events of the past rather passed me by. But this was a small price to pay for a performance of such powerful, intimate intensity. There was one more cast member, Angel's daughter Anna who appears very late one, here shared by Amelia Ioannou (whom I think I saw) and Millie Samuels Lee. The small band of seven, led by Joe Bunker on keyboard did miracles with Greg Arrowsmith's orchestrations and we never felt short-changed by the sounds emanating from the raised up pit. Similarly, Fabian Aloise's choreography managed to fit everything in without ever seeming to strain at the seams, yet giving the big numbers real heft. The production runs at Southwark Playhouse until 23 June 2018, and I do hope that someone picks this up; this show deserves to move into one of the smaller West End theatres to demonstrate that with the right production, right space and right performers, The Rink can work.